Finally embracing cropped trousers | Is This Mutton? Cropped, or shorter length trousers, have been around for a while but I have been stubbornly resisting them. Two reasons. I didn't like the idea of an expanse of ankle being exposed to the elements in winter, and as far back as 2013, I was lamenting the fact that worn with mid calf boots, they give the "beam me up Scottie" look. And they usually seemed to be worn with high heel court shoes, which I don't wear. Then two things happened recently to make me change my mind. First, Nikki at Midlife Chic showed how fabulous they can look, pairing black trousers with gold t-bar shoes. She showed the difference between wearing cropped jeans and wearing them long and bunched up over your shoes (which was my default). Then Samantha at Fake Fabulous revealed a secret, which is that expensive flesh coloured pop socks can easily be worn with these trousers and not detected. The secret is to buy from brands like Wolford or Falke, not the cheap multi packs. I also saw knee-length fish net pop socks worn by a fashionista and thought they looked pretty cool. 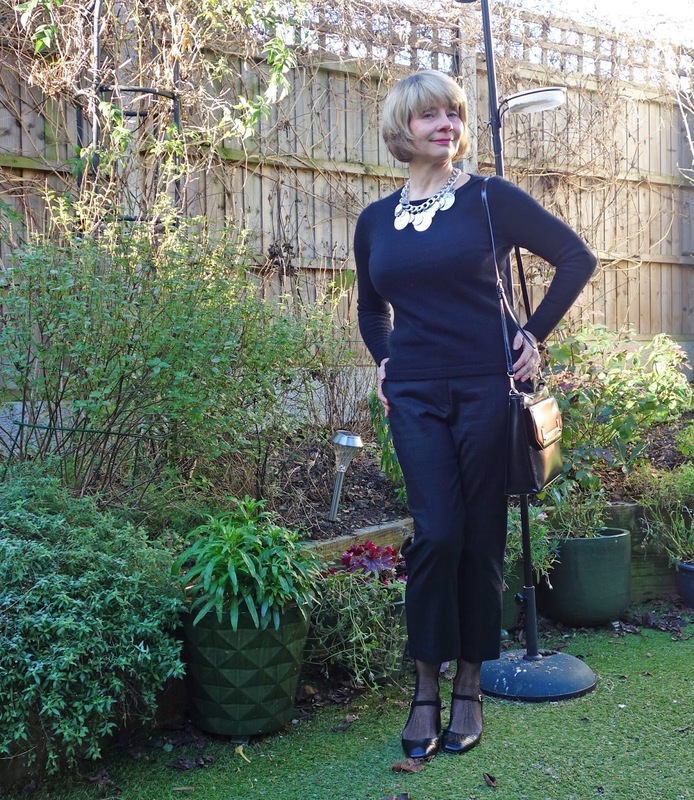 I bought these black cropped trousers in the Next sale and have paired them with black fishnet pop socks, a black cashmere jumper and a statement necklace. It was great to have a bit of winter sun to play with. I've also bought a pair of the Boden Cambridge cropped jeans which Nikki recommended. Did you (or do you?) have any reservations about cropped or tapered trousers? Linking with Nancy's Fashion Style, Shelbee on the Edge and Not Dead Yet Style. I think these shorter pants are perfect for many of the newer shoe styles! I know my mom was very hesitant to wear them too, but I think I've changed her mind!! I have several pairs of cropped trousers but have only worn them in warmer weather with flat shoes. I love the way you have paired the trousers with the pop socks and shoes, might to have to give this a go myself! I love cropped pants so I can show off cute shoes! And I am glad that you have finally embraced the crops because they look absolutely fabulous on you! So chic and super flattering. Thanks for linking up with me On the Edge. Thank you very much for linking up on Fancy Friday! I haven't put my toes in for this look yet (it also reminds me of Star Trek! ), although I have a pair of cropped red leather trousers that are very close in style. This is a lovely outfit (I'm looking for your cat). I think these look great. I did try wearing something similar a while back, but they were more like culottes and I only wore them once. being a shortie I have to be careful here.